Well, I don’t have much time today, I’m very busy and important, so you’ll just have to hop in my pocket and run around with me all day while I do the stuff I do. Which means you’re up at six and we’re riding around in heavy traffic for two hours in a stony silence, because I can’t blog while I’m driving. Then it’s off to the park, where we run for two and a half very slow miles. So slow that at one point we pass a power walker long enough to have a brief conversation. Probably could have switched jackets. It’s strange. I have a lovely building and the staff is amazing. I have no complaints except sometimes the executives who own the place scuttle around in groups of six or eight, and they flat creep me out. Not because they all feel like they have to wear suits (which they don’t, it’s 2013), but more because I think they might be shapeshifting reptiles masquerading as humans. I have no concrete evidence, just the general vibe I was getting the other day when a bunch of them showed up in the sandwich shop and stood there watching me eat a bowl of chili. But here’s the strange part. 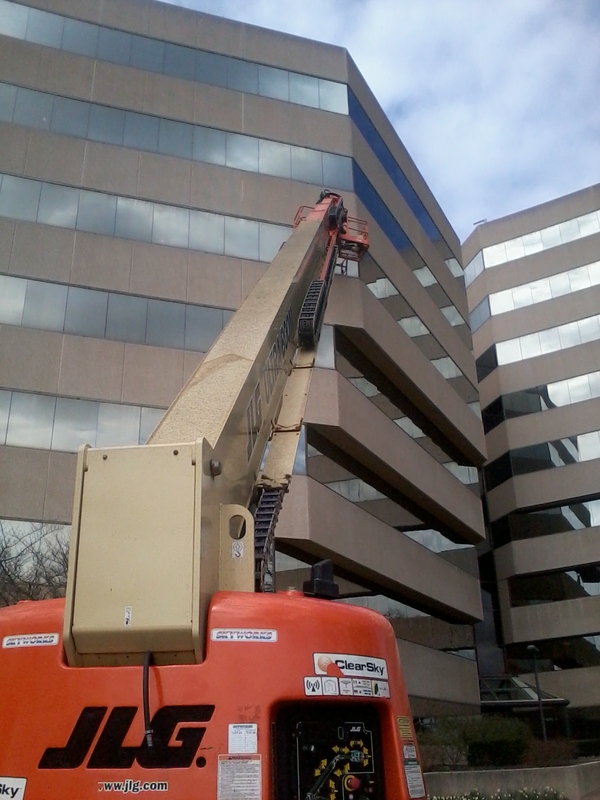 I have seen two types of window washers here at the Building I’m Not Going To Name. We’ll call this one Type A. The other kind is just a dude who sits on a board with a bucket and a squeegee and lowers himself down one story at a time from the roof. A time-traveling window washer from 1940. 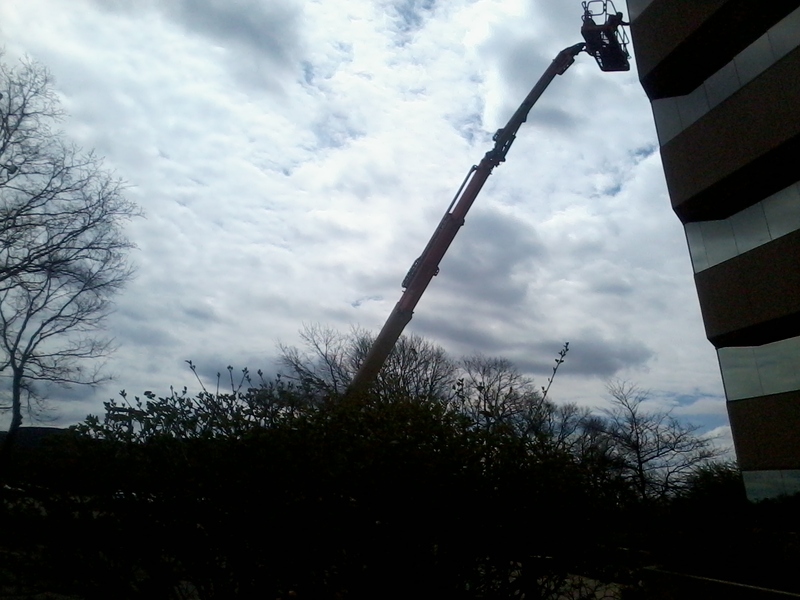 And it’s not like they got rid of him and then brought in this other guy with his gargantuan cherry picker. It’s more like they alternate. I’ve seen them both repeatedly, but never together. I really wanted to ask the guy up in the cherry picker how they decided when to call him and when to call the guy with the board and the bucket. Does he know the guy with the board and the bucket? Make a mental note, will you blogosphere? I need to remember to take that guy’s picture the next time I see him, and ask him if he’s just old school or what. He certainly does seem tougher than the man up there. Why does one get a 15-ton machine and one gets a rope and pulley? So let’s go on over to his cherry picker, see if we can get him down here. But no, sadly, none of the buttons work and the brakes are on. I guess they make these things so that you drive them from up there, that way you only need one guy, and that way no one like me can stroll up while you are washing windows on the sixth floor, and drive you around the building to my window, go back up to my office, and then start asking you questions through the glass using paper and a Sharpee. Oops, there’s security. Let’s go on upstairs and drink some coffee and Facebook for a while, make a few copies of stuff. Then back to the car and we’re headed out to the Licking County Courthouse where we have to walk into one office, hand them a piece of paper for them to stamp, and then walk into another office and have them stamp it, and then walk into another office and leave it with someone else. A monkey with a sign around his neck could do what we are about to do, but you can’t FedEx it in – someone has to walk it from room to room. I’m their huckleberry. I love walking from room to room. Pretty soon we’re done and we are startled by this statue out front. First of all, I think it’s a pretty cool statue. It looks like real people, and that’s how I like my statues. It appears to be a little girl who is upset, and a nice gentleman trying to console her. That’s a statue candy bar in the man’s statue hand. Does the little girl know this man? 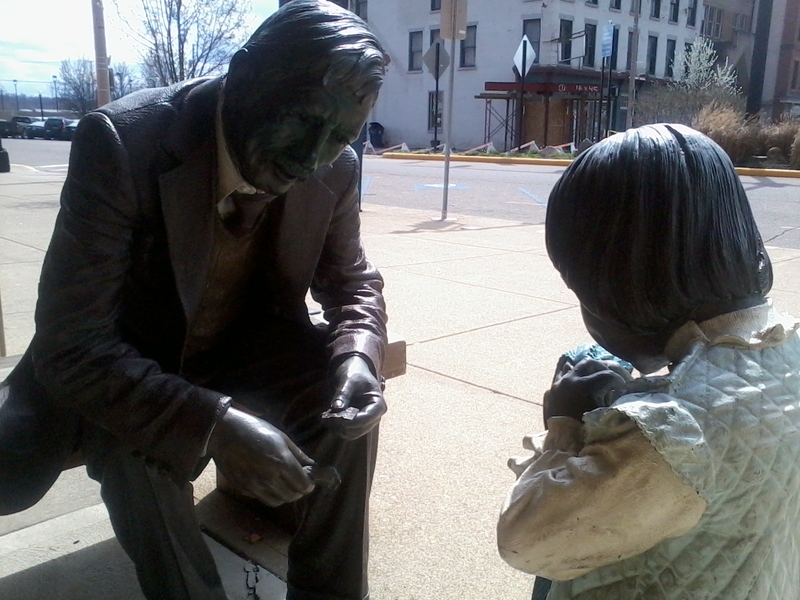 Or is this a statue of a little girl accepting candy from a stranger? We are getting a little bit creeped out by the statue, aren’t we? Seems like I’ve seen these two before and the little girl’s outfit and her blankey weren’t painted last time. 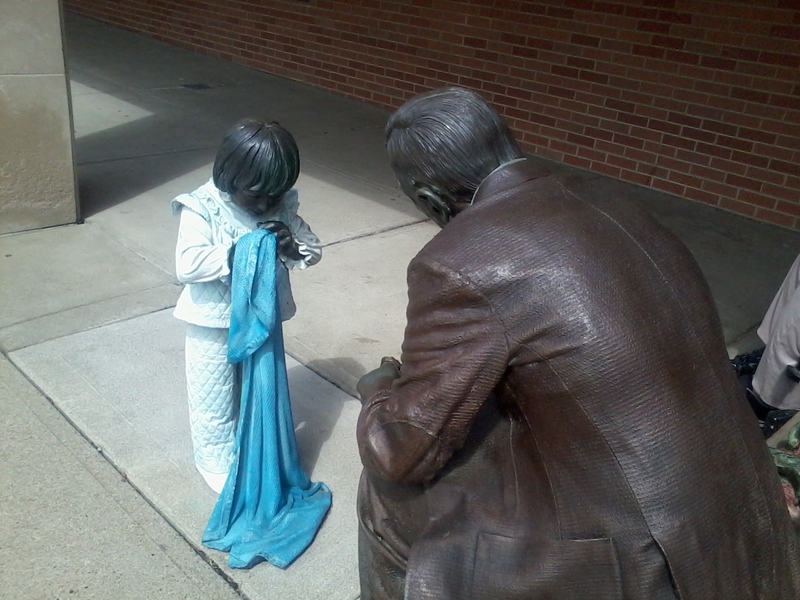 That’s a weird decision, out of the blue – Someone get out there and paint that freaky little kid statue’s outfit and her blankey. All right now let’s take notice that people are frowning at us for examining the statues for too long. We’re just looking at them, dudes, that’s what they’re out here for, right? You guys painted them, some of you must have been looking at them. Do any of you clowns know where this girl’s statue mom is, I don’t like this guy. Dad Alert going haywire. Yep, and there’s the crazy look, we get that a lot. Let’s just go ahead and hop back in the car and skedaddle. A fun run around town 🙂 I dig it!